Today has been a tale of two Taos. I'm getting more used to driving long distances. 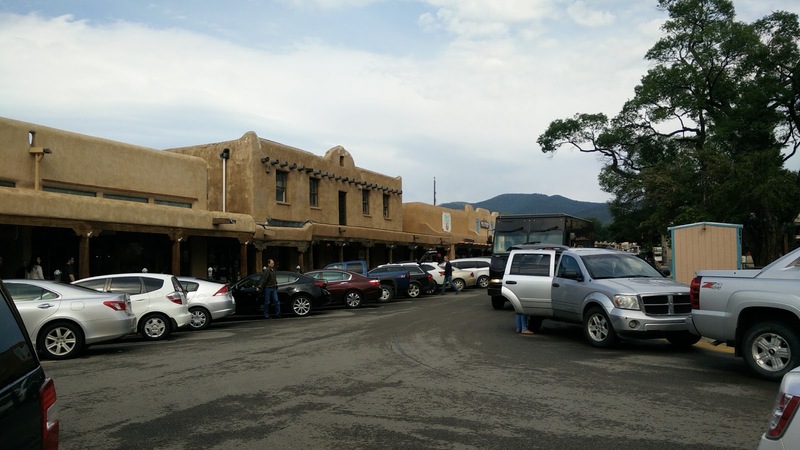 I drove the 200 miles from Durango to Taos without stopping. I hadn't planned it that way, I just presumed I'd stop when I tiredness hit, but somehow I kept going. 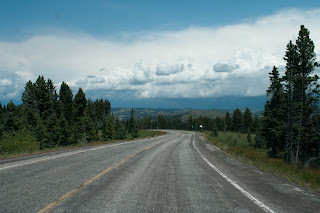 The drive was entertaining without being hard work - plenty to see, but also wide open roads with little traffic. I went through two national forests - San Juan and Carson. The first felt almost European - how I might imagine the landscapes of Germany or Central Europe. Small farms dotted among green meadows and hills and mountains covered in pine trees. Pagosa Springs appeared to be the main resort town servicing all this, and it looked very pleasant as I drove through. I was also aware that this was Indian country. A signpost to Navajo City reminded me I was yet again on the edge of the huge Navajo Nation. Another sign to the Apache reservation gave a small thrill. It brought back memories of all those times we played cowboys and indians as kids. Carson National Forest felt more remote. It was definitely part of the 'Great American Outdoors', and again I found myself climbing to over 10,000ft. The Forest contains Wheeler Peak, New Mexico's highest, and was more mountainous than I expected. I was driving with half an eye on the petrol gauge - aware that this wouldn't be a good place to run out of gas. I was grateful for the row of gas stations as I left the park - although it was short lived, as a power cut meant that none of the pumps were working. As it turned out, I had enough fuel to get me to Taos. After the Carson Forest, the landscape changed again to flat - dead flat - as I was now on the Taos plateau. The Rio Grande carves through this vast flat landscape - which I later learned was a volcanic field, spreading over 7,000sq km. From here to the Taos Pueblo, one of the highlights of my trip. 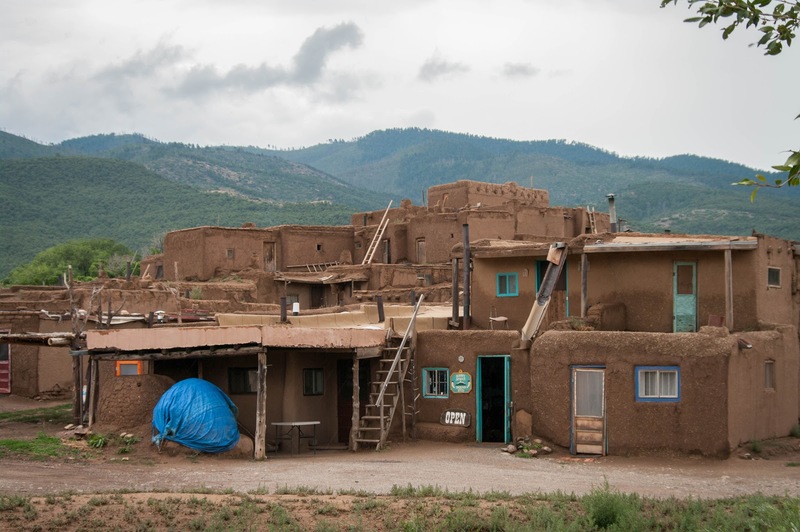 The Pueblo has been inhabited for over 1,000 years, making it the longest continually inhabited settlement in the United States. 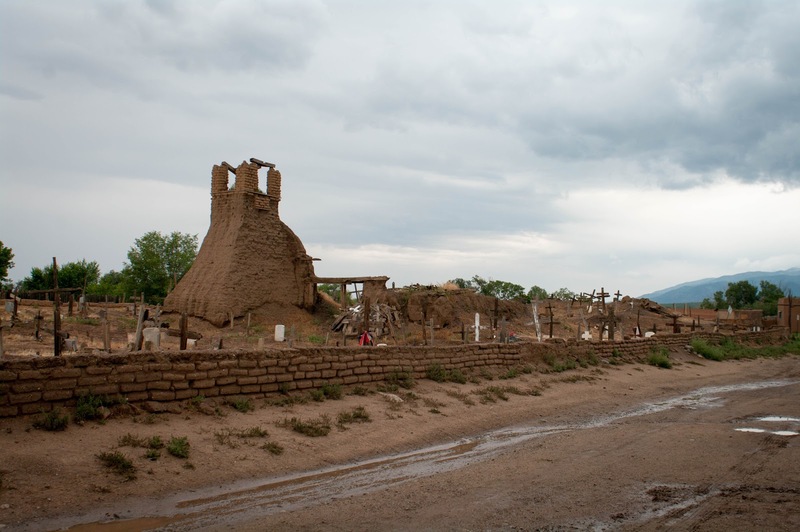 The most arresting features are the two multi-story adobe buildings that sit on either side of the Rio Pueblo, the river that flows through the middle of the village. These structures could be as many as a thousand years old - they were here when the Spanish arrived in the 1500s. But much of what's known about the village is conjecture. The Tiwa indians are notoriously private . They won't share their oral history of the village with outsiders, nor will they allow archaeologists to investigate. After the super-slick commercialism of much of the USA, this place had a medieval, ramshackle feel. In some ways it reminded me of Morocco, without the continual hawkers. The opposite, in fact - although a few of the houses were converted to shops, there seemed little interest in selling to the tourists. One shop I entered, the owner was asleep on a matress on the floor. I took a guided tour, hoping for more insights than I would get walking around on my own. It started in the church of St Geronimo, where the young student explained that the Indians all had two religions. They would attend church each Sunday and considered themselves Catholics, but they also continued to follow their ancient Indian religion. This was a completely oral tradition, not written down, not shared with anyone outside the Tiwa community. One of my fellow tourists - I will christen him 'Mr Annoying' - tried to push the guide to at least tell us the name of the religion, but she wouldn't. 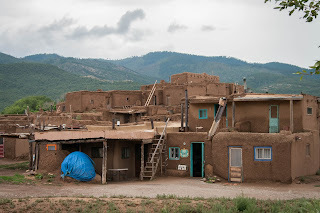 She told us that only a few families lived full time within the walls of the Pueblo. Within the walls there was no electricity or running water. Mr Annoying asked why they didn't use solar power or kerosene powered refrigerators, not understanding that this was a matter of choice for the Indians. He also didn't like the fact that their language wasn't written down ("surely it must be somewhere") and pressed her to talk to us in it. Which she wouldn't. Almost all the Tiwa live out on the reservation. There they have electricity, internet, fridges and all other modern technologies. 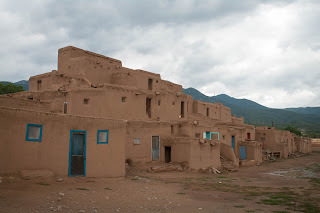 But each family still had a house within the Pueblo, which they would be expected to maintain. 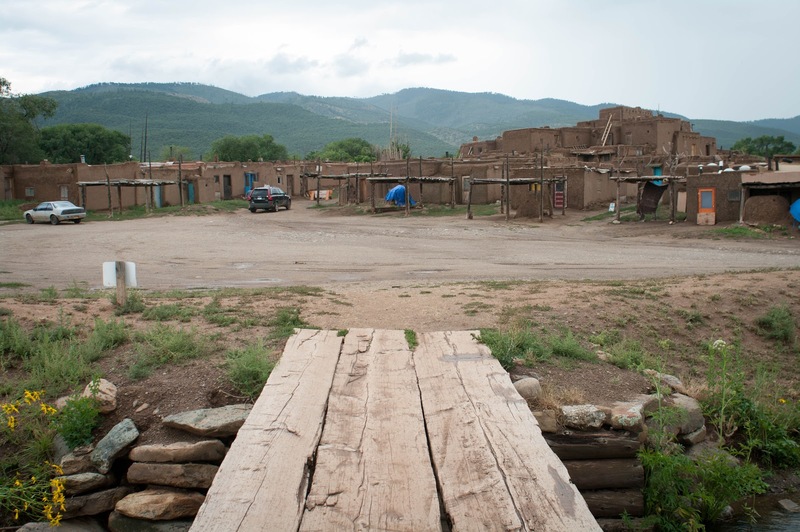 At various times of the year, for big festivals, the families would all move back into the Pueblo. They would then close the doors to the tourists and spend that time living like they always have, celebrating their festivals and religion in complete private. She also told us about their interactions with the colonists over the years. This goes in someway to explain why they choose to keep themselves to themselves. The Spanish mostly left them to their own devices. They demanded they converted to Catholicism, but once they did, they were left to pretty much self govern. The American settlers, however, didn't like the idea of self governing Indians, resulting in a war between the Indians and the Americans. The Indian women and children took refuge in their church - the Spanish had taught them that was a sanctuary, that they would be safe here. Yet the Americans didn't agree and bombed the church, killing most of those inside. The ruins still stand within the Pueblo, I would imagine as a constant reminder not to trust the Americans. Mr Annoying tried to pick holes in her dates ("you said 1842, but surely, at that time ..."). I thought, as we stood by the ruined church, that was extremely disrespectful. I wanted to see inside one of the houses, so I went inside one that was offering 'fry-bread'. 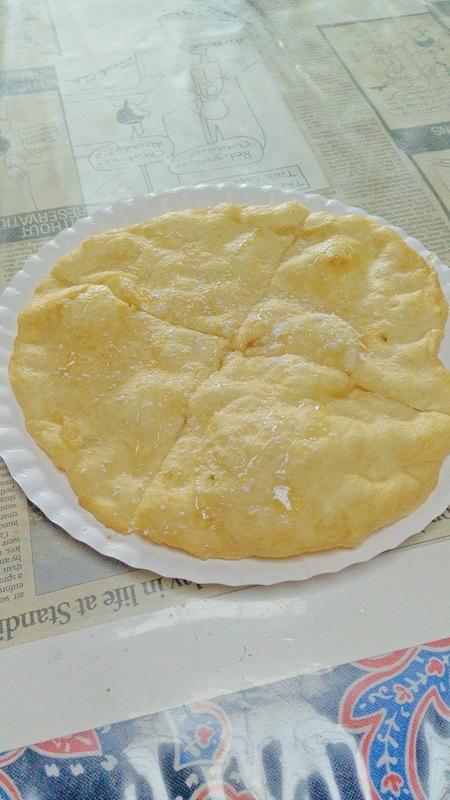 This is a native American dish (basically deep fried dough) that I've seen throughout the southwest. I also got to meet the family - grandmother, mother and daughter - who were all very friendly and happy to talk. The house was small inside, containing a kitchen (with modern cabinets!) and a table for guests. They had another house for sleeping in. I stuck a pin into Cambridge on their map of the world to show where I'd come from - and there were pins all over their map. We talked about the weather - it was pouring with rain at the Pueblo, which made it even more atmospheric - and how they made the bread. The little girl kept wanting to play with the mum's mobile phone. I loved the combination of the modern and the ancient. 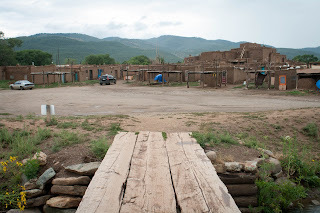 After the Pueblo I drove into Taos proper, and the jury is still out. Because of the adobe architecture, it looks a lot like the Pueblo, which makes the differences all the more obvious. 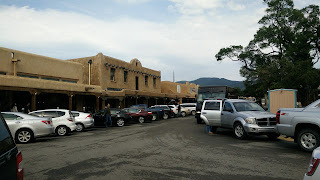 The compact town square is a parking lot for all the tourist cars, making it hard to see what it looks like, and each building is a gift shop of some kind. After the simple life of the Tiwa, it all seemed so crass and commercial. Taos is full of well dressed ageing hippy types. They've made their money being doctors or lawyers, they've retired up to Taos, let their hair grow, and are growing old ungracefully. Good luck to them, I say, but something about the town doesn't gel for me. Santa Fe - which many people consider to the be the most beautiful town in the USA - left me cold in the same way. 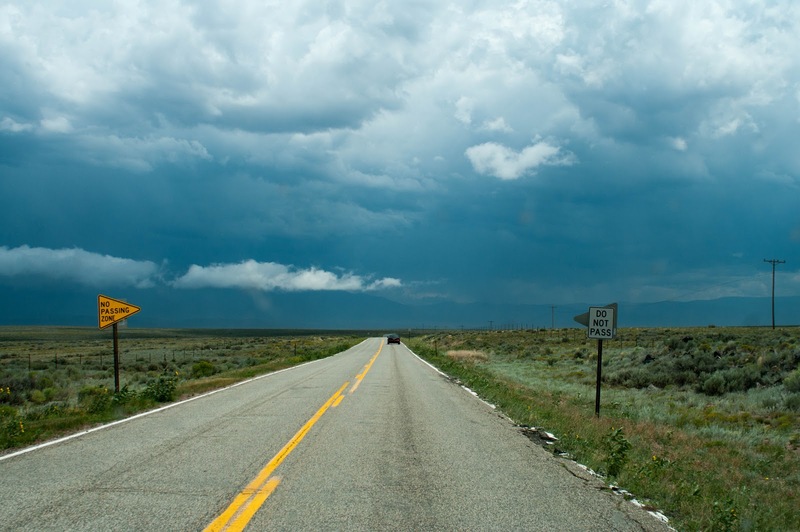 Next I'm off to Albuquerque - which I really liked when I went back in 2012. It's a real city, young and buzzing, not reliant on tourism like many places I've been recently. I'm looking forward to it - and rejoining Route 66 too! 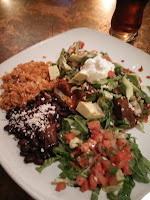 A good back street Mexican, with quite a few dishes outside of usual enchiladas and chimichangas. 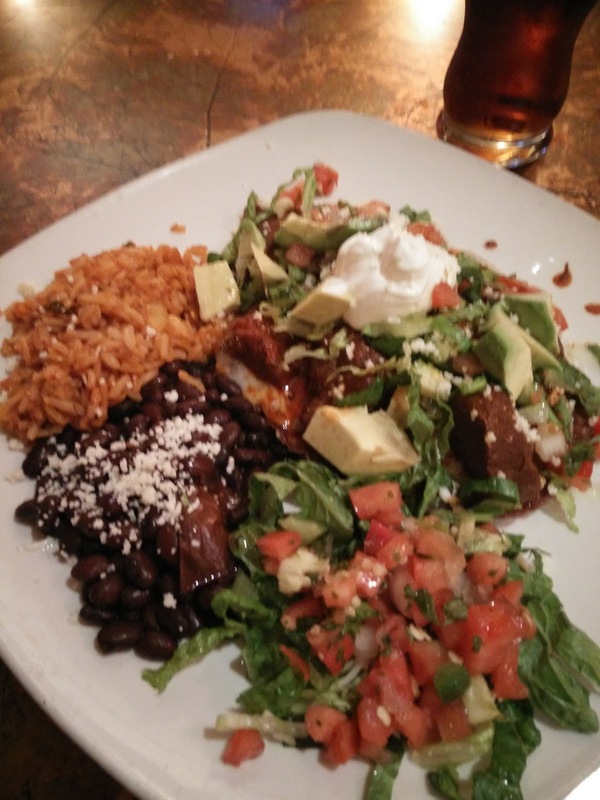 I picked a few dishes at random and wasn't disappointed. Oh, and come hungry, because there's no way you'll leave hungry!